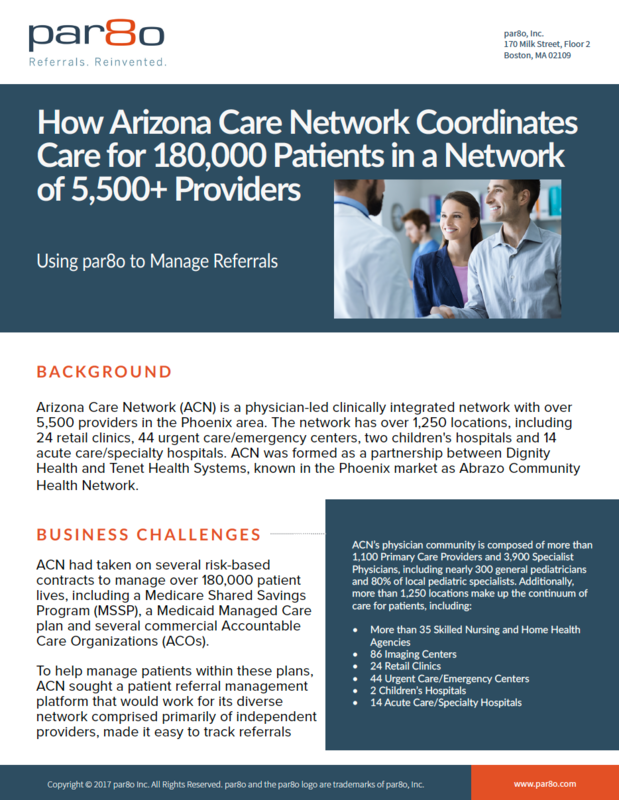 Arizona Care Network (ACN), a physician-led clinically integrated network with over 5,500 providers in the Phoenix area, helps manage over 180,000 patients with par8o's referral management system. par8o launched across ACN’s network in January 2017. Since then, referral sending volume has grown steadily at an average of 17% per week as practices become more familiar with par8o and its benefits. The network now sends over 5,000 patient referrals per month through par8o, and has seen improved patient access metrics such as a decrease in patient time-to-appointment, more patients seen within the clinical urgency as requested by the referring provider, and better, faster care coordination between referring and specialist offices.